The high-performance Reflex Pro family for designing, dimensioning and finding quotes is just what you need in a whole host of different environments. This includes the Reflex Pro app, which is ideal for on-the-go project planning as part of an initial consultation. All you have to do is enter key basic parameters and you’ll be presented with various solutions in no time to make life easier while you’re out on site. Available in the App Store and on Google Play. 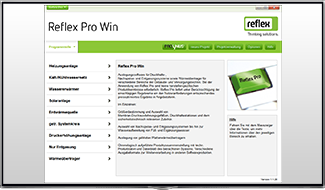 Then there’s Reflex Pro Win, which is available as a PC download for convenient usage with the full range of services – even without Internet access. 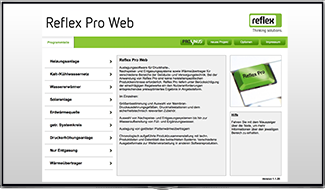 There’s also the Reflex Pro Web version, which relies on an online connection to ensure you’re always working with the very latest data, which you can download in various formats – including PDF. No matter what version you’re using, this design software is just what you need for all aspects of pressure maintenance, make-up and degassing systems, delivering accurate results in no time at all with minimal effort.